A couple of weeks ago Rolling Stone magazine published a very amazing article by Gavin Edwards breaking down U2’s performance at Live Aid in 1984. In the five years between 1980 and 1985 U2 had reached critical acclaim with their first four albums Boy, October, War and The Unforgettable Fire, but were not yet the massive international supergroup they would become. Around six minutes into the song, Bono looks into the crowd, and senses an opportunity to really connect with the audience, physically. 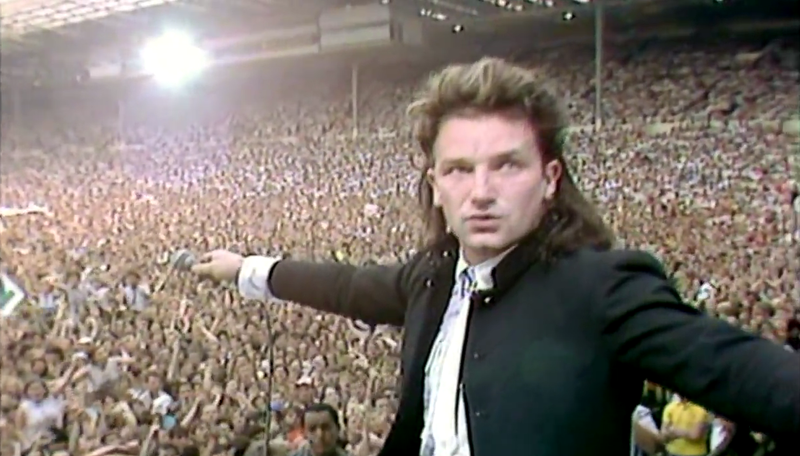 The distance to those at the very front is far, and high, but undeterred, Bono sets off on his journey, arriving at the lower balcony where he implores the stewards to pull one woman from the crowd. 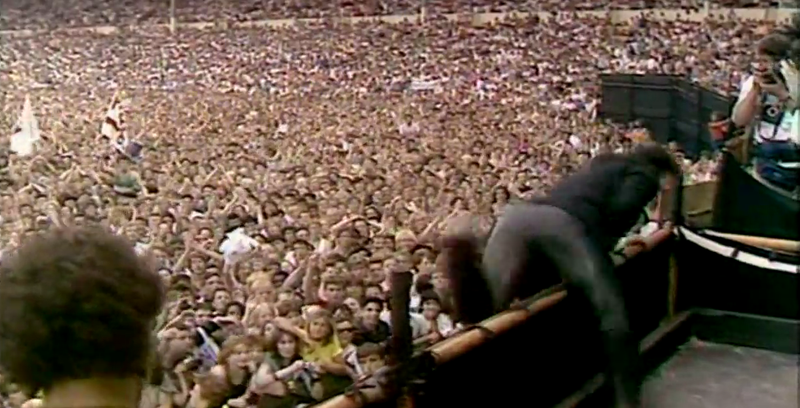 While two women are plucked from the crowd, Bono sees a third still struggling to scale the barriers. The platform he is on is high up, but undeterred he takes a leap of faith, over the barrier and into the pit below. Bono is now far out of sight from the rest of the band – The Edge, Adam Clayton and Larry Mullen, but they play on, riffing, while it is now well over two minutes since Bono began his epic journey. The drama is being shared across the globe with an an estimated global audience of 1.9 billion, across 150 nations. 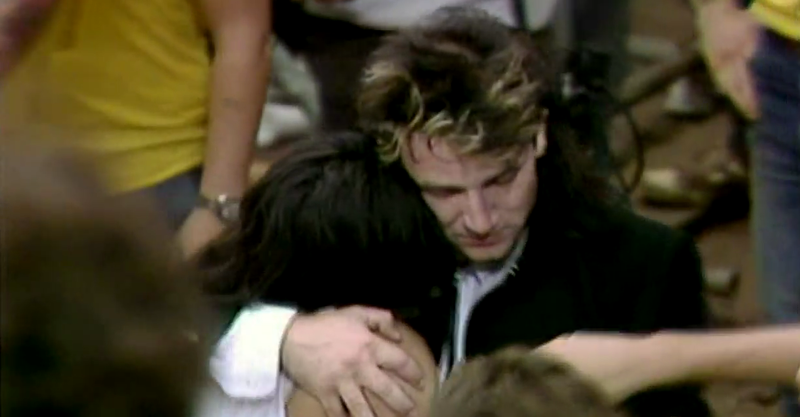 The young woman is finally pulled free, and beckoned into the arms of a clearly emotional Bono. This symbolic connection is huge, breaking down not only the distance between band and the stadium audience, but with the television audience too. A huge cheer rings out around the world as the two embrace. After more than eight minutes of the song being played, Bono has to make the journey back to the stage, climbing up via the press photographers enclosure. he embraces the other two women who are already there, and reaches for his microphone, to complete the song. At this moment, Bono yells out to all of us “I’m wide awake! I’m not sleeping”. It is now clear to the whole band that there is no time left for their final song, which would have been Pride in the Name of Love. So Bono starts to improvise, singing a snippet from the Rolling Stones’ Ruby Tuesday. 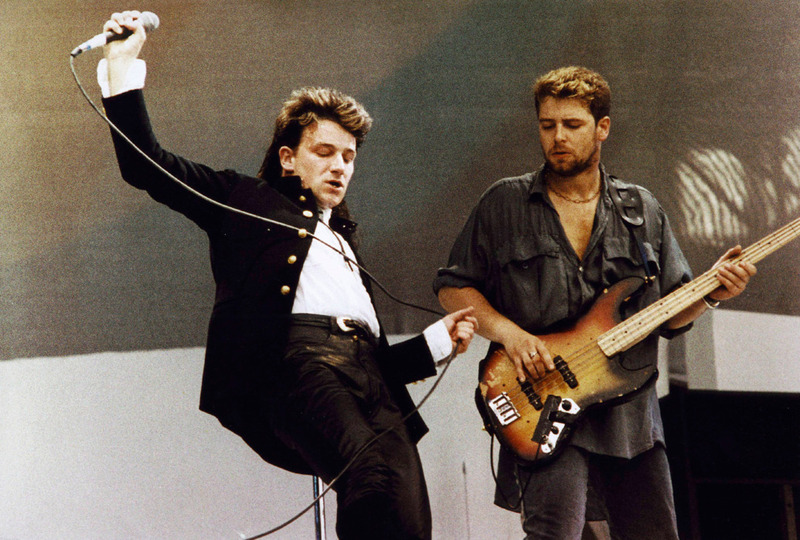 There is a moment where Bono is fully present, being well aware of the impact his actions are having on the rest of the band, and he turns around, and just looks, saying nothing, but saying to the band, trust me, this will work out OK, be with me, follow me. Bono continues to improvise, with more phrases from Sympathy for the Devil and Lou Reed’s Take a Walk on the Wild Side. Each and every person in the entire stadium sings along with the ‘Doo doo doo, doo-doo-doo-doo’ part, and the connection with not just one person but with the whole is solidified, not in our minds but our hearts. As Gavin Edwards writes in the Rolling Stones article, Bono really had felt that he had messed things up, and that he had failed both himself and the band. There was huge argument backstage with everyone in the band, but not long afterwards U2 were hailed as delivering “one of the noteworthy performances of the day”, catapulting U2 to global fame. Of course Live Aid was all about raising money for those people starving in Africa, and what was needed that day was artists transcending their egos, to communicate in some way the magnitude and importance of this monumental day. Bono’s instincts as a performer managed to transcend the carefully thought-out plan of the group, and so here we see the way in which artistic performance can often triumph over carefully thought out plans made in the head not the heart. A performer knows when to improvise and when to stick to a plan, and they know how to connect with people, reduce the distance, and connect on an emotional level. Bono’s performance was exceptional for us and captivating because it was an authentic performance, and not a cynical performance of acting, hiding one’s true character behind vacuous words or actions. People can sense this, they feel it, and yet many people in leadership positions still struggle with this concept. I also wrote recently about the fact that in the world of sustainability it’s not all unicorns and rainbows. There are a lot of counterfeit performances in those who lay claim to leadership in sustainability, and sometimes we need to jettison the fluff and get back to a good old piece of rock and roll. What an epic performance from Bono. A classic. Can people say this about your own? Many thanks to Gavin Edwards whose article U2’s ‘Bad’ Break: 12 Minutes at Live Aid That Made the Band’s Career provided the inspiration for this one. ← What Role Does Artistic Consciousness Play in the Design of Customer Experiences and Interventions for Change?